3BR Golf-Course Vacation Rental Haines City, sleeps six. 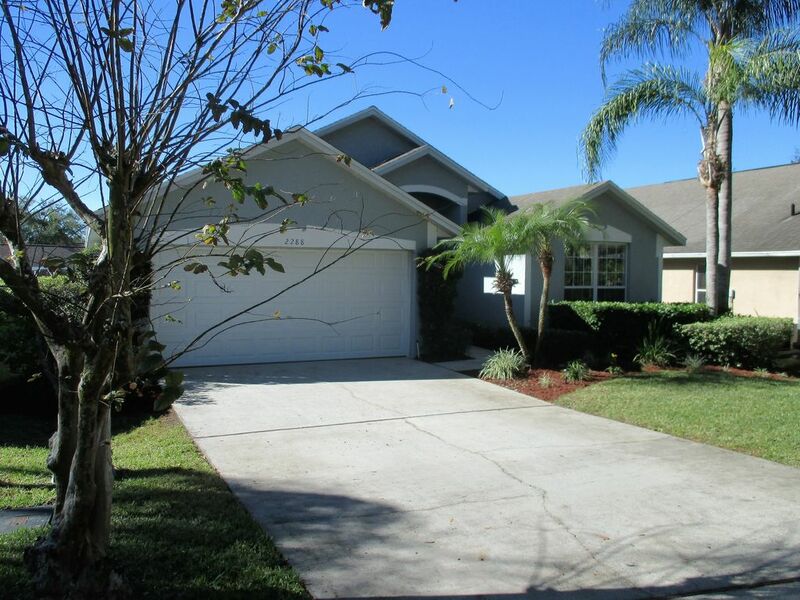 Villa Bonita is located at Southern Dunes, a quiet, friendly and relaxing neighborhood twenty minutes away from Disney World. The community is set on an 18-hole, true gem, Golf Digest 4-star-rated championship golf course. Even if you do not play golf, Southern Dunes is a great place to stay because of its natural beauty. The subdivisions are separated from each other by the fairways of the golf course. Our well-appointed, spacious villa features fast wireless internet enabling you to surf the internet and access your email, a 40 inch LCD HD TV and a 32 inch TV, a DVD player, DVR recorder, expansive volume ceilings, tiled floor, an open and fully-fitted kitchen, and a master bathroom with a garden tub and large walk-in shower. There is an additional bathroom with a walk-in shower with a rainshowerhead, the living room and master bedroom have sliding glass doors that lead to the porch with a ceiling and the south facing screened-in swimming pool with a furnished deck near the pool. There is a 24 hours guard-gated entrance. Special features around the villa include the Southern Dunes 18-hole championship golf course and the private neighbourhood park with preservation areas and a landscaped lake. The beauty of Southern Dunes is that, while being able to relax in a 'country club' atmosphere in a beautiful villa, you are only twenty five minutes away from Disney's main gate and central Florida's many attractions (avoiding the traffic jams on the other roads leading to Disney). You will have the best of both worlds... Inside Southern Dunes you will have local amenities that include tennis courts, a community swimming pool, a play area and a clubhouse with restaurant and bar. And just minutes away you will find Winn-Dixie supermarket and Wal-Mart at the gate, and Eagle Ridge Mall nearby on Highway 27. 'The weather was great and the kids loved the pool. It was a little cool in the evening but it did not stop my kids from swimming. The golf course was great. If our property is not available, please email or call about the availability of other properties. In the master bathroom Large walk-in shower. A tub and a walk-in closet. Free calls within the continental US, the territories of the US and Canada. Iron and iron board near the dryer. Very fast download and upload. HD quality. DVR recorder enabling you to record programs. You can view the programs later on. (2) 40 inch LCD TV in the living room; 32 inch in the master bedroom. Furnished with garden chairs and loungers. Our villa has an outdoor screened private pool. In the pool heat season the pool is heated. The neighborhood Southern Dunes has an olympic size pool. This pool is not heated during the pool heat season. You will be able to make free telephone calls to anyone within the continental US, the territories of the US and Canada. During your stay you will be able to play golf on one of the best golf courses of Florida. Also, if you wish, you can enjoy dinner at the clubhouse after a well spent day at Disney World, Sea World, Universal Studios, Legoland or Busch Gardens. The neighbourhoods of Southern Dunes are surrounded by the golf course. At Lake Wales after a scenery route and an encounter at Spook Hill you will be on your way to Bok Tower a beautiful botanic garden which offers you also concerts. Just beyond the gate of Southern Dunes you will find everything you need for your daily shopping. Within twenty minutes you will find the Lake Wales mall with shops and a cinema. There is a discount for stays longer than seven nights. The amount of the discount depends on the number of nights you stay at Villa Bonita. The monthly rate is based upon a stay of 30 nights. You will receive a credit card authorization form to be filled in. The filled in credit card authorization form is the security deposit for the damage protection.